I want you to know the truth about quit smoking hypnosis. The high stress and anxiety. The strong urges and cravings. The weight gain. The "pain" of withdrawal. No wonder why only around 3% to 5% of smokers have successfully kicked their smoking habit using willpower alone. The addiction can be so intense that even with the use of medicine, only around 10% of smokers are able to quit. 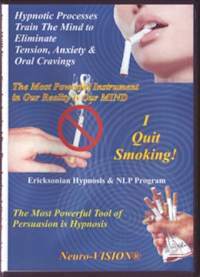 Thousands of people have successfully stopped smoking using a breakthrough hypnosis technology that automatically and instantly programmed their mind to quit. All they did was relax and listen to some powerful audio recordings; and before they knew it, their cravings and addictions were gone! Sounds like a magical cure? Well, you'll be glad to know that this isn't some type of untested "miracle" pill or method. It's actually based on science, and has proven to work effectively through advanced research and testing. If this sounds too good to be true, please put your skepticism aside until after you read this entire letter, because it could be the last thing you'll ever need to save your health and life. As you continue reading, you will discover more about my breakthrough hypnotherapy methods which combine Hypnosis with NLP (Neuro-Linguistic Programming) with Hypnosis, which will convince you that they actually reprogram the core parts of the smoking addiction so any smoker - no matter how hopeless their situation may seem - can finally kick this nasty habit out of their system for good. There are three main parts or "components" of a smoking addiction. 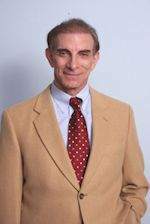 Below, I explain how these parts contribute to a person's cravings for cigarettes, and how my hypnosis methods work in reprogramming and eliminating the compulsions to smoke cigarettes and tobacco products. Part 1: Habituation or "Habit." This is where the unconscious mind has made an association between smoking and other behaviors like drinking coffee, or watching TV. You know how this works. As soon as you sit down to watch TV, for instance, you get a strong craving. My methods reprogram these unconscious associations so that watching TV, for example, actually compels a person to REJECT cigarettes! This is called extinguishing a conditioned response. This mental program is written when an infant gets cranky, and it's mother puts a bottle in it's mouth. It gets distracted, relaxes, and falls asleep. Because of this, our mind was trained to get relaxation and pleasure when something goes into our mouth. With my methods, the unconscious mind is reprogrammed to receive relaxation and pleasure by having it use stress producing thoughts to automatically trigger relaxing thoughts instead. This makes the tension and anxiety magically disappear. Note: These first 2 parts make up 90% of the addiction to cigarettes, and is comprised of the Mental Aspects of smoking. Part 3 is a physical addiction to Nicotine, which accounts for only 10% of the smoking addiction. Scientists tell us that all nicotine in the body is metabolized in about three days. Clients who used my NLP & Hypnosis methods to quit find that when Parts 1 & 2 are reprogrammed, the physical addiction is actually such a small component, that it has no bearing on a person's ability to quit... and they never miss the disease-causing cigarettes that they previously could not resist. The unconscious mind is the part of you that won't let you quit smoking. In other words, your mind is mostly causing the cravings and urges. But the problem is that it is impossible to change the unconscious by willpower alone. If you've tried to quit smoking several times, you probably got tense and nervous, and your cravings and urges to smoke took over, forcing you to light up. Or perhaps you began to eat everything in sight. That's because 90% of the smoking addiction is mental, and only 10% is a physical addiction to nicotine*. Now here's the good news... whatever is caused by the mind can be cured by the mind! But of course the right kind of professional help is require. And this is where I come in. My methods of hypnosis unleash the power of the unconscious mind to eliminate cravings for cigarettes and the urge to smoke. If you look at the case histories of my clients, they were finally able to stop smoking cigarettes, and they didn't have to suffer from withdrawal symptoms, anxiety or weight gain. Would you also like to effectively lose your cravings for nicotine, and make the entire quitting process as easy - and relaxing - as listening to some audios? Then get ready to kick out your smoking habit once and for all! 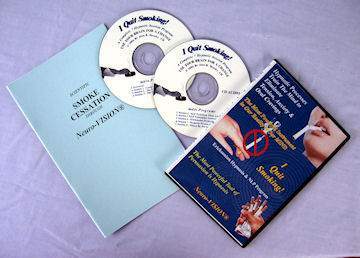 This quit smoking hypnosis CD program is safe and effective to use. It has helped thousands of smokers of all ages throw away their cigarettes and become comfortable non-smokers. People who ordered these quit smoking hypnosis CD's reported that they were able to throw away their cigarettes on the very first day of listening! With this program, my CD clients the same kind of success that many of my clients who attend a series of office private hypnosis sessions (seven) do, but without the expensive fees. Note: We've added the 7 Full Hypnosis Sessions to 2 CD's. That eliminates 5 CD's to save you $44.00. Each individual Session plays separately from the other sessions, just like on a music CD. And the best thing is that the quitting process was effortless, painless and quick! They just relaxed and listened while the audio played, and it automatically programmed their unconscious mind to kick out their smoking addiction. Stop Smoking Techniques Used By Others? As previously mentioned, *90% of the addiction to cigarettes is mental, and only *10% is related to nicotine and a physical addiction. This is the reason that treatments like nicotine gum, patches, shots, and laser therapy have a poor track record of success – they only tackle the *10% physical addiction, which is a tiny part of the problem. Permanent smoking termination starts in the mind, and then extends to the body. My hypnosis program automatically "hard-wires" the mind to stop smoking, that's why it is so much more effective than any other. What Makes The "I Quit Smoking!" Program Better Than Other Hypnosis Programs? 16 Page guide e-book (Value $12.97) filled with the Tips, Tricks, and Educational Information will insure your permanent success. Even if for some strange reason you elect to send the program back within our 90-Day "I'll Buy It Back From You" no-questions asked, money-back guarantee period, you get to keep this 16 page guide book with my compliments! Note: When you place your order, an accurate email address must be supplied to receive the e-book. Personal One-On-One Guidance (Value: Priceless). Hypnosis is not just my livelihood, it is also my passion! So whether you have any questions after you receive my program, my guidance is available to you by email. And I won't pass you off to a secretary or another therapist, I will help you myself! How Much Would You Invest To Break Free From Your Smoking Prison, Regain Your Health And Save Thousands Of Dollars Every Year? You already know that smoking damages your health, and that of the people around you. But how do you feel when you realize that -- because of the tobacco companies' greed for your money, they don't care how sick they make you, just as long as they keep you hooked, so that they can take as much of your money as possible? Do you want to keep on spending $2,000.00 to $3,000.00 or more every single year on something that is slowly poisoning and killing you? Of course not! I'm sure you'll agree that investing a few hundred dollars one-time - to save thousands of dollars every single year - is something any smart and sensible person would be willing to do. That's why thousands of my office clients paid a $560.00+ professional fees. But since I want to reach out and save as many suffering smokers as I can, and at the same time spare them from high professional fees, I recorded the sessions in audio CDs. These are the very same sessions that thousands of my clients have paid $560.00+ to get! That's only $6.39 per session! Why is the price so affordable? That's because you're getting everything in physical format. There's no need to come to my office. With these CDs, my clients get a similar experience (and achieve the same results) right in the comfort and privacy of their own home. A Token Of Appreciation: Just in case you are returning the program (although I don't see that happening after you've quit smoking), you can keep the 16 page e-guide as my way of saying thank you for test-driving the "I Quit Smoking!" hypnosis program. Do You Have A Poor Imagination? Start Download of Instructional Session 1 & a Power Relaxation MP3. required. No sales tax and no shipping fees anywhere. Isn't it worth it to finally have peace of mind, enjoy excellent health, and save more than a thousand dollars every year? Imagine how your life will change after you've quit with the help of my quit smoking hypnosis program? The process is effortless, easy and automatic. P.S. Remember, the risk is on me. "I Quit Smoking!" has to work, or you will get a full refund. Plus, you get to keep the 16-page e-guide whether you return the program or not. Now that's way better than a 100% money-back guarantee, isn't it? It has absolutely changed my life! I wanted to write and let you know, all these years later, how pleased and thankful I am for the gift you gave me when you cured me of smoking through your hypnosis. I was doubtful it would work but was desperate, having tried everything else to no avail. But, sure enough you told me that I would. not have to return after 4 or 5 visits, and that I would never smoke again. I must say I found that funny, since each time I left your office the first thing I did was light up a cigarette. But, this trip, white I chuckled, explaining to my husband what a joke it was to think I would never smoke again, and how we had wasted our time and money. But, Io and behold, I did not ever light up again ... and what is more I cannot be in the company of anyone who smokes and can pick a smoker out of a crowd like a blood hound. I am so grateful because I have asthma; I am sure from my smoking habit; and other ailments too. It’s hard telling how long I would live if I had never touched the darn things. I smoked for 33 years and it was Lauren Bacall in some movie my friends and I went to that got us to go buy a pack and practice ... we were 15. I didn't smoke in front of my parents, which kind of slowed down the effect, but when I got older I smoked more. 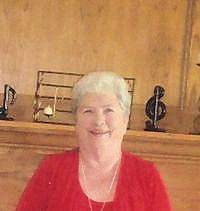 At any rate, thank you, you probably added years to my life, as I will be 82 in July. Thank you.